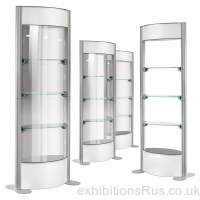 We can supply portable free standing display shelving solutions for exhibition and trade show events. These are supplied in component form, high quality aluminium framed units that are assembled on site with a few quick and simple allen key bolts. Smart acrylic shelves and the option to add branding with graphics able to be applied at extra cost and a transport case too.